Butch holds a nice and quite spunky female steelhead from yesterday. 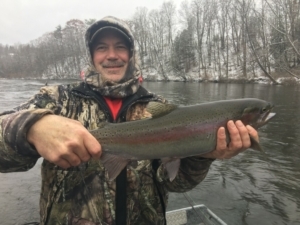 The Muskegon river fishing report for December 6, 2018 in the Newaygo, Michigan area continues to focus on the fall/early winter steelhead season. River levels came up a bit due to last weekends near 2 day “drizzle”, but once again is dropping and the nice levels we had, only lasted for a day. With our run of unfortunate luck specific to operation of the Croton hydroelectric dam, which is run by Consumers Energy, the river could be low and clear once again and I continue to scratch my head wondering who’s really in charge of such things at Consumers ? The steelhead season will continue regardless of what the knuckleheads at Consumers do, it just makes if more difficult for “migratory” fish to move into and throughout a large river system such as the Muskegon, when water levels are bouncing up and down like a yo-yo….and I don’t want to hear ANYONE say it’s for electric generating purposes….hog wash ! Click HERE for current Muskegon river water flow data. With both fly fishing and light spin tackle equipment, we’re focusing our attention on more winter like water to find both steelhead and trout that are willing to bite. Covering water is the key with such conditions, as what may have been a comfortable “lie” for the fish one day, could change the next with fluctuating river levels. With both short and long term weather forecasts calling for highs in low 30’s and lows in mid 20’s, we hope to see water temperatures stick where they are for another couple weeks if possible. Click HERE for up to date weather information. Present water temperature is in the 38-39 degree range.